Neuro-vision therapy, also referred to as vision training or vision rehabilitation, is an optometry subspecialty. Neuro-vision therapy is prescribed to develop, improve and/or enhance visual function so an individual’s vision system functions more smoothly. The goal of neuro-vision therapy is to build stronger, faster, and better-connected neural pathways. Neuro-vision therapy can be beneficial for individuals of all ages. 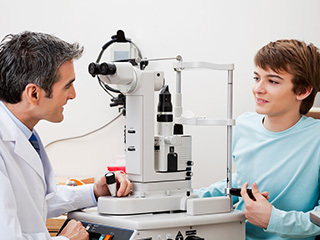 The goal of treatment is to help ameliorate vision problems and improve a patient’s quality of life by maximizing vision performance and comfort. In order to understand how neuro-vision therapy can improve your vision, it is important to understand exactly how the brain creates an image. At the most basic level, a nerve cell sends and receives electrical signals from sensory neurons. This input and output is used to process visual images. Throughout their life, neural networks continually reinforce themselves in response to new experiences. Body-mind interaction is an important part of this learning process. While the quantity of neurons does not increase, new connections between these neurons can be built at any age. The more frequently a pathway is stimulated, the stronger the pathway becomes and the faster the transmission along this pathway will be. The goal of neural-vision therapy is to reinforce and strengthen these new pathways. There are several similarities between occupational therapy and vision therapy, especially when it comes to improving hand-eye coordination and visual motor integration. However, neuro-vision therapists have completed more in-depth training in the field of visual motor integration, as well as the use of lenses, prisms, and filters. Who Benefits from Neuro-Vision Therapy? Vision therapy is especially beneficial for individuals with ocular motor dysfunctions, binocular dysfunctions, accommodative dysfunctions, visual motor and visual perception disorders, learning-related vision problems, traumatic brain injuries, myopia control, amblyopia, and strabismus. Neuro-vision therapy may also be prescribed for patients seeking sports vision enhancement. Neuro-vision therapy is customized to meet the needs of an individual. For example, if you are seeking sports performance enhancement, you will receive therapy designed to improve visual processing speeds, reaction times, visual endurance, accuracy, and eye teaming. Individuals with vision-related learning difficulties will receive therapy that focuses specifically on improving the visual input skills and visual processing skills required for efficient reading, writing, spelling and mathematics. Depending on a patient’s needs, neuro-vision therapy may last anywhere between six weeks to one year. Most problems can be improved with bi-weekly sessions over two to three months, as determined by an eye care professional.